By Robert A. Harasta, Jr. The tradition of corrugated iron began in England, where in 1829 H.R. Palmer, the engineer for the London Dock Company patented the design for corrugated iron sheet to cover the platforms to protect cargo from the weather. The patent was bought by Richard Walker, a carpenter who installed the materials over the dock, and who subsequently supplied corrugated iron for the newly opened Port Adelaide that was installed by the South Australian Company in 1836. In 1844, Phoenix Iron Works, of Glasgow, patented a double-barreled fluted machine for corrugating iron by passing a flat sheet between fluted rolls to longitudinally press the metal into corrugated sheeting. 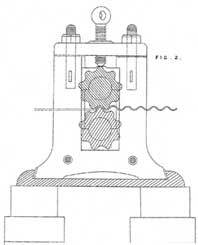 The patent also included a curving machine to bend the corrugated sheet to the desired radius. This is the same method American Tank uses today! With the advent of galvanizing in 1844, Phoenix Iron Works went into mass production and pre-fabricated corrugated galvanized buildings were sent to California during the Gold Rush of 1849. 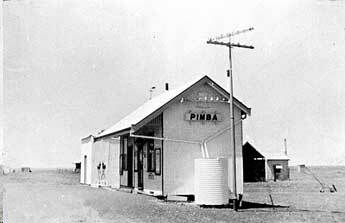 By 1852 corrugated galvanized iron was being widely used in the pioneer towns of Australia and the Western United States. As railways enabled the expanded distribution of metal and other manufactured goods into more remote territories in the Americas and Australia, the use of corrugated iron sheets for roofing and siding became prevalent architectural substitutions for tile shingles and wooden clapboard siding. Metal sheeting was leak-free, fire-proof, rodent and insect resistant, and provided a means of obtaining purer rain-water collection. Other advantages of corrugated materials were they could be arched and have longer structural spanning capabilities than other materials. 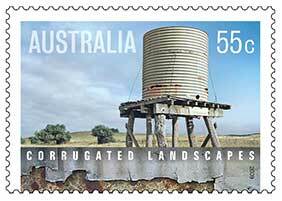 In Australia, there was another reason for the use of corrugated iron in remote areas; defense. In 1885, the government in Queensland specified their telegraph stations to be built from heavy gauge corrugated iron so as to be spear proof as well as fireproof to afford protection from aboriginal rebellions and uprisings. 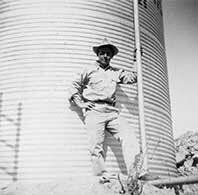 Circular corrugated galvanized iron tanks were first patented in 1857 by John Carter in Victoria, London and rapidly became a prominent feature of the Australian landscape. 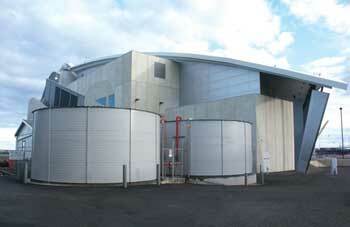 Today, these tanks still dominate the rainwater harvesting and water storage markets in Australia. 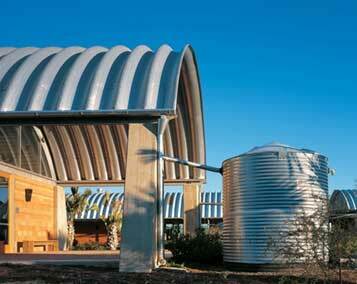 Corrugated tanks have become ubiquitous with rainwater harvesting for practical reasons as well. Not only do they have a proven reputation for long service life, water stored in metal tanks is less susceptible to bacterial and algae growth than other porous materials such as cement, wood or plastic. With the advent of cast iron pipe in the 1850's, private utilities and municipalities were able to develop large scale storage and water distribution systems, but in small towns, farms and ranches throughout the US, surface water collection and shallow wells were the main sources of fresh water. But the growing demand for more sanitary water sources for disease control and readily available reserves for fire protection gave rise to the need for more affordable above ground water storage systems. In the US, wood was abundant and the material of choice for these elevated water storage structures until the end of the 19th century. With improved methods of industrial production, steel became an economical alternative to timber. This was especially true since timber prices begun to rise in the 1890s. It was in this era that John F. Holbrook, a prominent constructor of water works in Southern California, founded a water tank and pipe supply company in Los Angeles to serve the rapidly expanding agricultural and oil industries. Holbrook purchased belt driven corrugating and curving machines and they were brought to L.A. by wooden cargo ships that sailed around Cape Horn in the late 1890's. 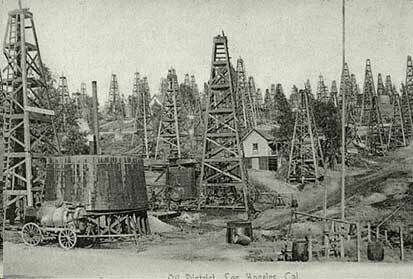 As oil exploration and discovery blossomed in California, most of the oil production was stored in large wooden tanks. Unfortunately, in 1907 a gigantic redwood tank burst, spilling its contents onto Echo Lake, which burned for three days. This lead to the increased use of riveted steel tanks for oil storage until the mid 1920's when a brush fire generated enough heat to melt the solder used for seam sealant and the resultant oil leaks caught on fire. The riveted and wood oil production tanks were gradually replaced by bolted and welded tanks that were more fire resistant and could be constructed in larger capacities. The "Black Gold Rush" of the early 1900's in Los Angeles caused the population of this small ocean side town to triple and this created demand for water storage in the outlying areas as homes and farms began to fill the countryside. As word of the wonderful weather, beaches, mountains and Hollywood spread across the nation, L.A. would continue to grow and become one of the largest metropolitan areas in the world. 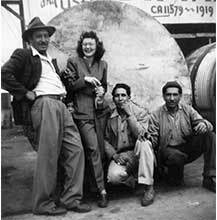 As oil production and population expanded in the L.A. area, the corrugated galvanized tank industry flourished. National Tank & Mfg. was established in 1913 with a focus on oil and water storage vessels. Western Tank & Pipe and several other pipe manufacturer's benefitted from the synergies of riveted pipe construction which was the predominant means of making pipe seams from the 1850's until the 1930's when lock-bar and welded seams replaced riveted joints. Meanwhile, in the Mid-Western US, farming and ranch operations generated demand for livestock feeders and grain bins while a burgeoning oil region was being developed in Oklahoma and Texas. Companies such as Butler Mfg. Co. (est. 1901) and Columbian Tank Co. (est. 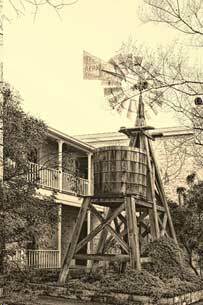 1893) in Kansas, became industry leaders in the dry and liquid storage markets. With standardization and improvements in mass production of threaded fasteners and, in part due to the physical requirements of the riveting process, most companies migrated to fastening tank panels with bolted connections. Columbian Tank Co., (now CST Industries) provided their first bolted steel tank to the oil industry in 1916. The invention of electric arc welding in the 1920's enabled forming and joining of heavier steel plates and gave rise to larger and more exotic storage structures. 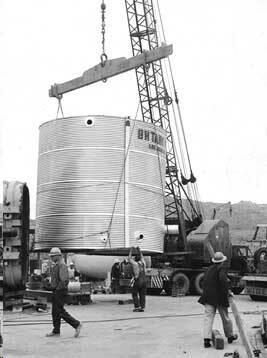 In 1932, Chicago Bridge & Iron Co. (now CBI) completed their first welded steel oil storage tank. One of the advantages of welded seams for tanks and vessels was that the material did not need to be overlapped as is necessary with riveted and bolted seams and heavier plates could be effectively joined. Nonetheless, the Oil Boom years along with the Roaring 20's would come to a crashing halt as the Great Depression held the world's largest economy hostage in its firm grip. As companies down-sized, a few of J.F. Holbrook's former employees decided to start their own tank company. In 1935, ex-foreman Paul Johnson rented a small lot on San Fernando Rd. 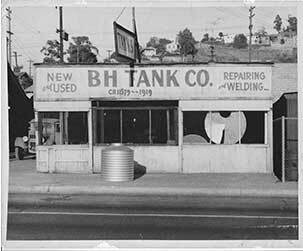 in Northeast Los Angeles on the main highway leaving town and began a tank repair business. He lacked funding for the machinery to punch, corrugated and curve galvanized sheet to make new water tanks so he asked to borrow some seed money from his step-son, Bob Harasta (Sr.) Bob, who had been diligently saving the money he had earned while working odd jobs while still in his teens, eagerly agreed and the machinery was purchased. In gratitude to his step-son, the new business was named BH Tank Company. Soon thereafter, Paul was unable to continue to work so Bob stepped in and took over the reins in 1938. The small company began manufacturing hand riveted corrugated galvanized steel tanks at a time when most tank manufacturers' were converting their operations to welded tank production to serve the local oil industries. The onslaught of World War II posed other challenges and opportunities. With nearly all steel production being dedicated to the war effort, Bob volunteered to join the Navy and was trained to be a mechanic with a focus on aircraft repairs. His young wife, Goldie, was left in charge of the shop. While Bob was repairing planes in the Pacific Ocean, Goldie successfully negotiated a major storage tank refurbishment contract with the Army and earned enough profit to purchase the business property. After the war, in the subsequent boom years of the late 1940's and 1950's, the tank business, and their family, began to grow. With the added skills of welding and engineering, Bob quickly transformed BH Tank Co to included watering troughs, swimming pools, welded oil storage tanks, and tank towers to enhance the time tested and proven corrugated tank product lines. The company was renamed BH Tank & Manufacturing Works in 1955 and Bob's products were being sold through Sears Catalogue and numerous water pump and well drilling contractors. The business continued to thrive and BH Tank earned a solid reputation for quality and service. Sadly, Bob suddenly died in 1960 leaving Goldie behind with seven children (six girls and one boy, Bob Jr.). With the momentum of the company's good reputation and stubborn perseverance, Goldie managed to maintain the company until 1978, when her only son, Bob Jr., would take over the family business. Bob's high energy and creative business skills pushed the business to new record levels. In 1980, the business was incorporated under the abbreviated name B.H. Tank Works, Inc. (BHTW). With the advent of MIG wire welding in the early 1980's, there was increasing competition from small companies that could easily weld flat galvanized sheet metal. Wire welding was fast and did not require the artful craftsmanship required for hand riveting corrugated tank panels. To counter this competitive challenge, BHTW focused on large field erected tanks that were engineered to meet the new seismic designs being instituted by the Uniform Building Code. 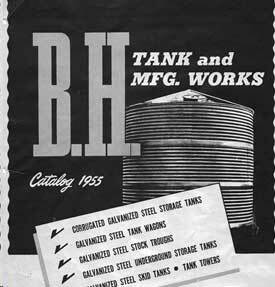 In 1985 BHTW purchased National Tank's corrugated tank manufacturing machinery which could accommodate heavier gauges and longer sheets than the original BH Tank machinery. J.F. Holbrook Company called it quits in 1987 so BHTW bought the remnants of their antique equipment and hired their remaining crews. 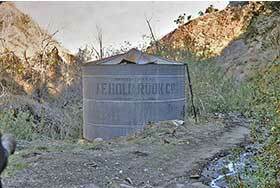 The only remaining corrugated tank manufacturer's were located in Texas and Australia. 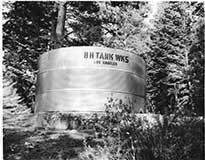 In 1980 BH Tank began selling and installing bolted steel tanks, especially when capacity requirements were greater than 100,000 gallons. In 1990 BH Tank purchased the assets of Lance Enterprises from Pete & Judy Mandeville who had developed proprietary bolted tank erection methods and tools. 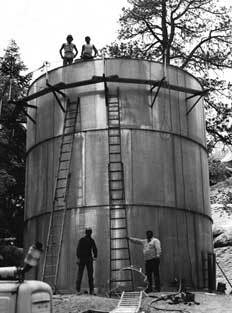 Over the next two decades, BH Tank became one of the largest distributors and erectors of bolted steel tanks in the US. BH Tank's engineered corrugated tank business continued to grow, specializing in storage capacities between 10,000 to 100,000 gallons. 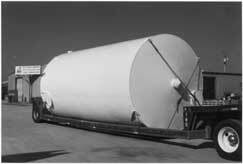 In the late 1980's, rotationally molded water tanks made from high density polyethylene, began to take hold of the small residential storage tank market. 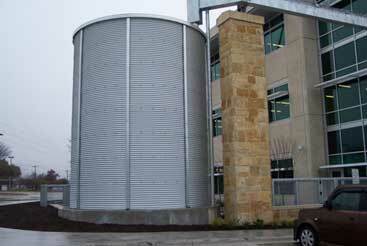 Material and labor costs were far less than building and coating steel tanks. But "poly" tanks continued to be limited by size and structural design capabilities, not to mention mold capacities. To expand the steel tank manufacturing capabilities and enter new markets, BHTW acquired Valley Tank & Mfg (VTM) in Monterey County, CA in 1996. Besides large capacity shop built welded water and waste-water processing tanks, VTM manufactured UL 142 Labeled Double-wall Fuel tanks and provided the capability to build Ammonia Diffusion tanks. With a track record of engineering prowess and code compliance, BH Tank continued to expand into market niches that had been abandoned by larger fabricators and where smaller companies lacked the experience and capability to perform. BH Tank continued to expand its three divisions, Corrugated, Bolted and Welded and in 2006 it acquired H&H Fabrication in Madera, CA. 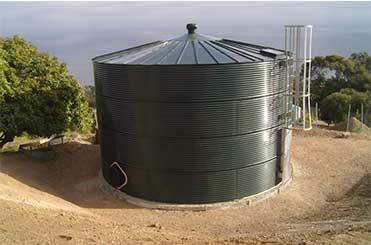 Having become one of the only corrugated water tank manufacturers remaining in the USA, BHTW caught the attention of BlueScope Water (BSW), an Australian division of BlueScope Steel, that was in the process of consolidating the best corrugated metal tank companies in Australia, including Pioneer Water Tanks with a focus on rainwater harvesting. In 2008 BSW acquired BH Tank and consolidated it with Pioneer's existing tank operation in Texas. BSW also acquired Highline Tank in Perth, AUS and introduced their proprietary woven tank liners and advanced corrugated tank technologies to the US. Interestingly, BlueScope Steel also acquired Butler Buildings and other "downstream" businesses that produce and utilize profiled metal building products. 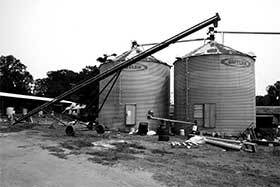 By this time, several US and Canadian grain bin manufacturers had begun selling grain bins with PVC liners. These corrugated metal structures took advantage of the synergy between large corrugated grain bin design and fabrication and could be assembled by experienced grain bin erectors. Although competition was fierce, especially during the Great Recession of 2008-2010, the acceptance of liner-based corrugated tanks in the US was growing, especially in Texas and California due to extreme drought conditions. 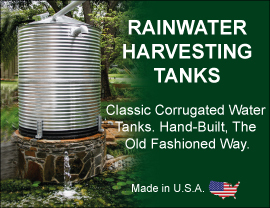 As corrugated metal tanks had become ubiquitous with the Australian landscape for rainwater collection, they are now becoming the iconic symbol of rainwater storage in the USA. As BlueScope Water expanded into the US market, the Global Economic Downturn was taking its toll on the parent company based in Australia. In 2013, BlueScope Steel decided to discontinue its US based BlueScope Water operations and sold the physical assets to the company that had consistently been the largest distributor of BH Classic Corrugated tank's for the last twenty years, American Tank Company, Inc. of Windsor, CA. American Tank Co., Inc. is continuing BH Tank's tradition of engineering excellence and hand craftsmanship that has endured through competitive incursions, economic upheavals, and natural disasters for over 75 years. American Tank is dedicated to continue the historical manufacturing traditions that evolved from the Industrial Revolution and survived into the Information Age. By incorporating traditional metal tank designs with modern materials and technologies, American Tank offers products that maintain the charm and character of our predecessors, and yet, because of the inherent structural efficiency and beauty of corrugated metal, have become emblematic of modern tank construction. Established in 1975, American Tank has become a water storage tank powerhouse built on a bedrock of service and continued dedication to the art of corrugated tank manufacturing.